The BJP central manifesto released on Monday was bereft of any idea which could have fired the imagination of the voters. If the Congress added bounce to its campaign with the eyeball-grabbing NYAY or the promise of a minimum annual income of Rs 72,000 for those below the poverty line, the BJP seemed to have little new to offer, news portal The Quint said in its opinion piece on Tuesday. “A closer look at the 50-page document reveals a mélange of promises, much of which is old wine in new bottles,” the opinion said. Preparing a manifesto becomes all the more difficult for a ruling party whose performance has been patchy. The BJP manifesto was an example of this, it quipped. The same Ram Mandir that has figured in all BJP manifestos since 1989. The same vow to abrogate Article 370. The same promise to enforce a uniform civil code. It’s surprising that the party has not tired of repeating promises it perhaps can never keep. Rajnath Singh, who headed the manifesto committee, claimed that the BJP had the ‘widest consultations’ of all parties. He said six crore people were involved in the exercise. Yet, despite spreading its net far and wide, the BJP seems to have fallen back on its tried and tested recipe of national security. The issue figures prominently this time, in sharp contrast to the last election, the opinion piece said. 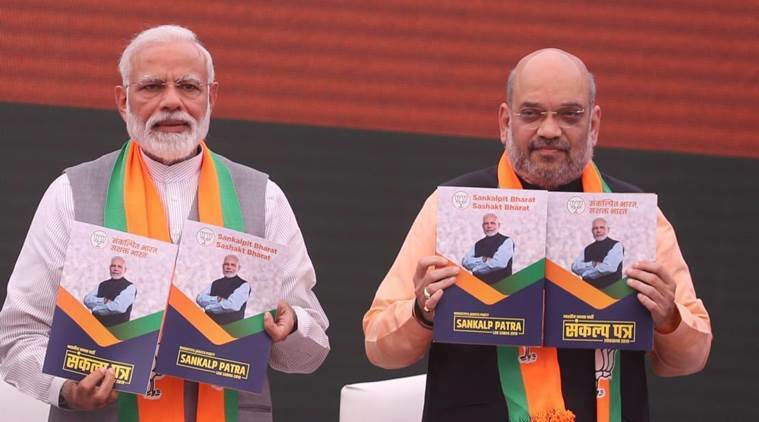 In fact, if the 2014 campaign was marked by innovation and creativity, it was probably because the BJP stepped out of its usual narrow paradigm to make the economy its main focus. It called for new ideas and modern thinking. Five years later, it’s back to business as usual with national security forming the bedrock of its poll narrative, the Quint said in its opinion.